I don’t know how I could forget about posting this recipe but I apparently did. 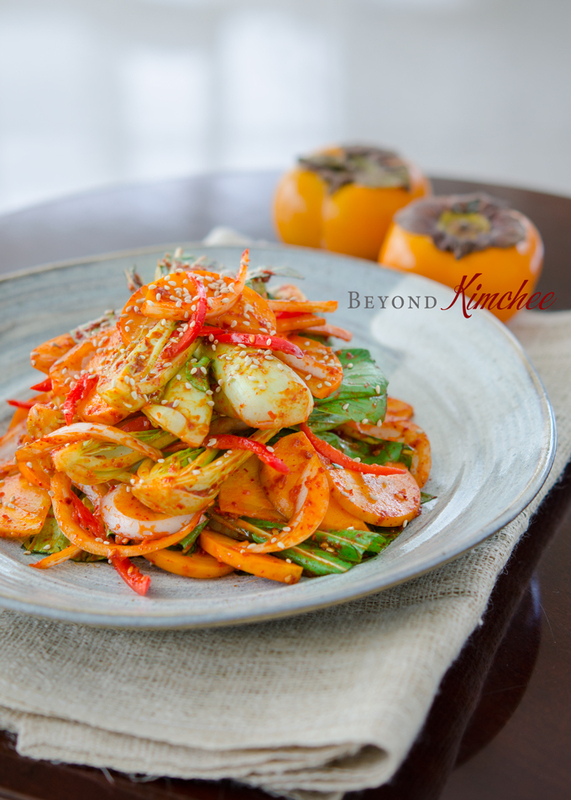 I made this Bok Choy Persimmon Kimchi Salad (청경채 감 겉절이 샐러드, chunggyoungchae gam gutjeuri salad) to post on my blog but I left in my photo library for 2 years. Gees, Holly~! 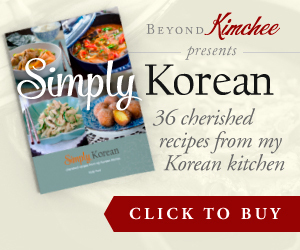 I adapted this recipe from one of the Korean cookbooks I had. 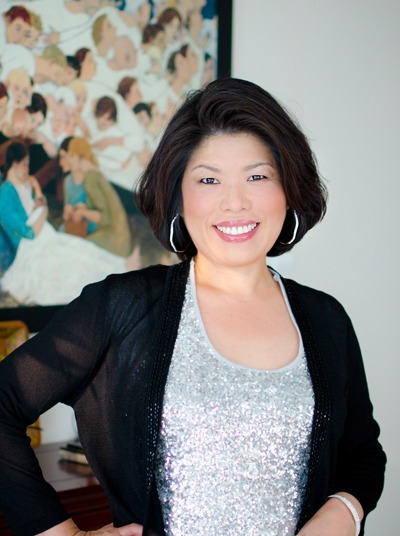 It was written by a famous home cook who teaches the upscale Korean dishes to very wealthy housewives in Korea. The crisp tender texture of Bok choy partners with sweet persimmon so nicely, and the spicy and tangy chili vinaigrette combines the two perfectly. You will need a bowl of rice to serve this and you might find yourself dishing up more rice after you taste this salad. 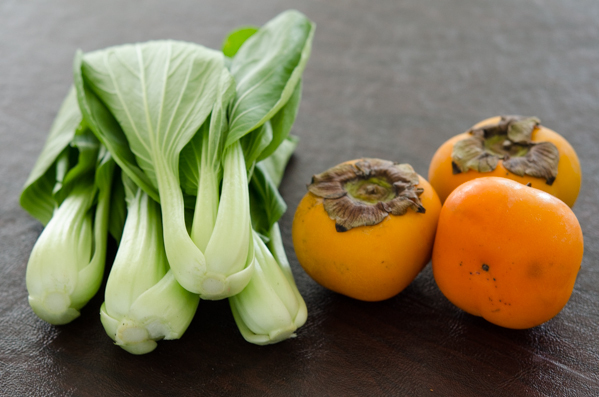 Here are very fresh bok choy and sweet persimmon. Bok choy is Chinese origin vegetable. It is like cross between nappa cabbage and romain lettuce with their crisp tender texture and a hint of sweetness. I’ve always loved them cooked in authentic Chinese way, stir-fried with garlic. I, however, found that raw Bok Choy can be quite delicious in certain salads. 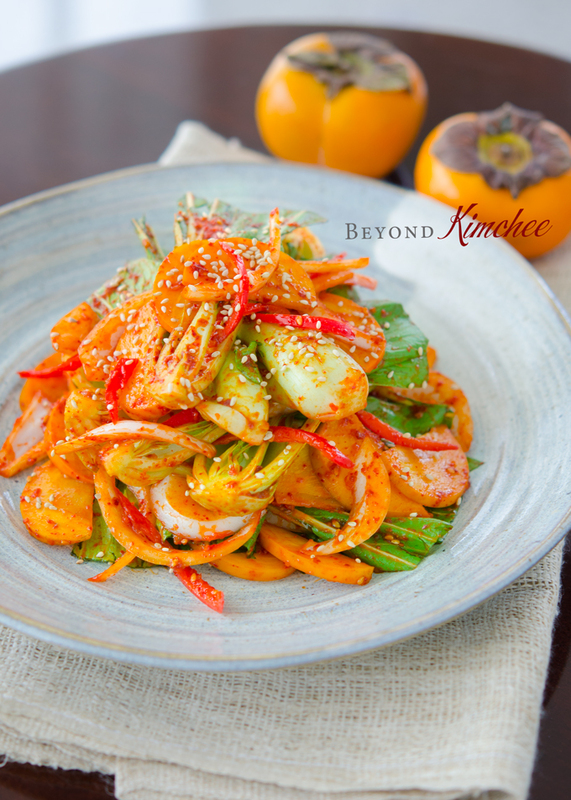 It is perfect choice to make Kimchi salad. 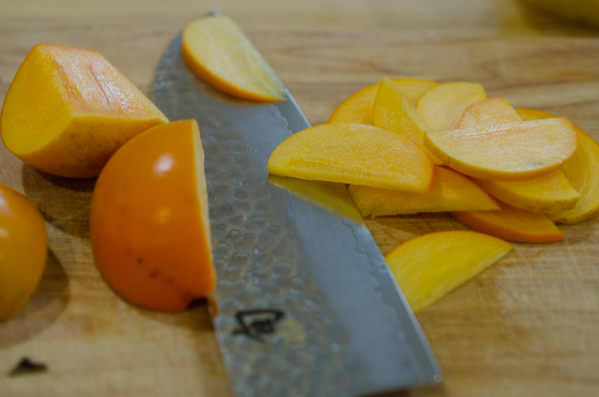 Persimmon is quite a common fruit in Eastern Asia. There are two types. One is called “dan-gam (aka fuyu in Japanese)” and the other is, “hong-shi (aka Hachiya)”. Dan-gam, which looks like squashed tomato, is crunch and sweet; perfect for salad. Hong-shi is more elongated heart shaped with soft jelly like texture inside. It is very sweet but should be well ripen before you eat, otherwise it can yield “furry” tasting. 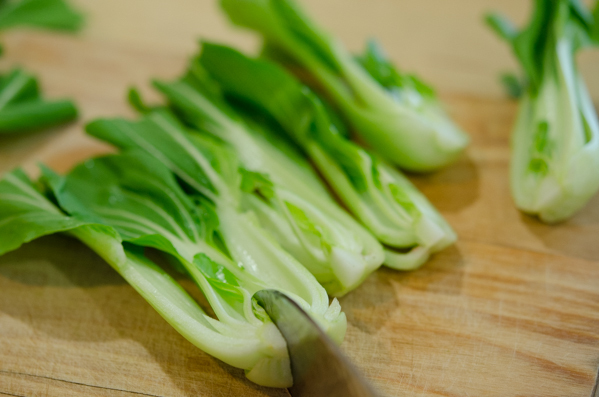 Cut off the bottom ends of leafy part of bok choy because they can be a little fibrous. 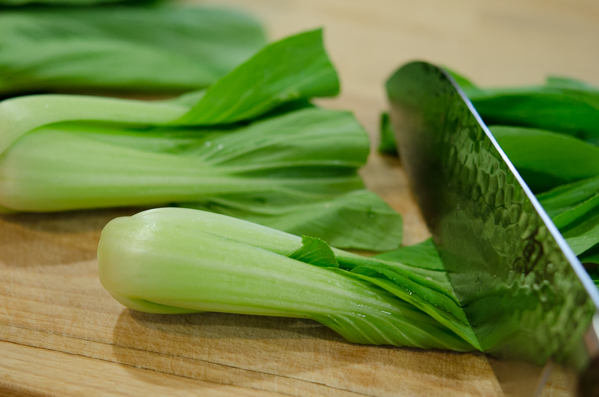 Cut half or quarter of the bok choy lengthwise depends on their size. Rinse them well and remove all the water by using a salad spinner. Wash the persimmon with baking soda and slice them very thinly. 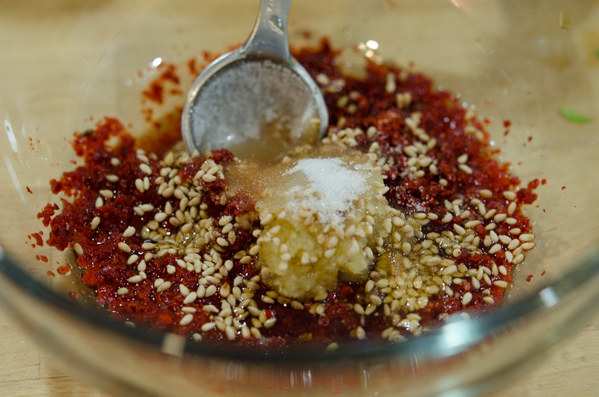 Here my chili vinaigrette crew members; fish sauce, sesame seeds, garlic, sesame oil, vinegar, , corn syrup, Korean chili flakes, and lemon. You will also need a little bit of sugar, too. 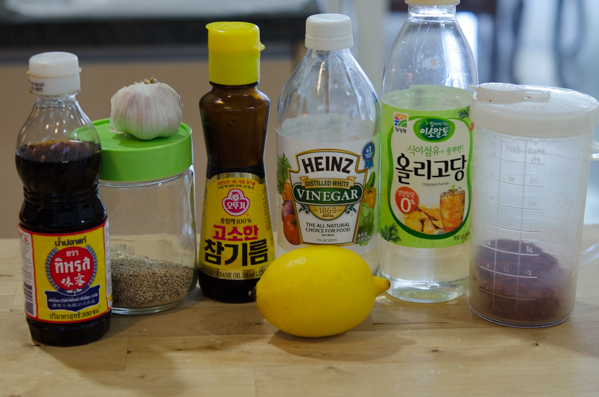 And if you have the Korean plum extract, add some by all means. If you don’t, just skip it. Toss everything together and your salad is so ready to serve. Serve immediately or your can make it ahead 1 hour in advance. Enjoy the fresh taste of this delicious salad with some rice. Is it spicy? Yes, for sure. Make sure you have a plenty of water on the table. But it is worth a couple of ounces of your sweat to enjoy delicious Korean salad though. Don’t you think? Soak the onion slices in the water for 5 minutes and drain. Set aside. Cut off 2 inch of bottom leafy parts of Bok choy and discard. (You will only need the white and the leafy parts near the stem only) Half or quarter the Bok choy lengthwise depends on their size. 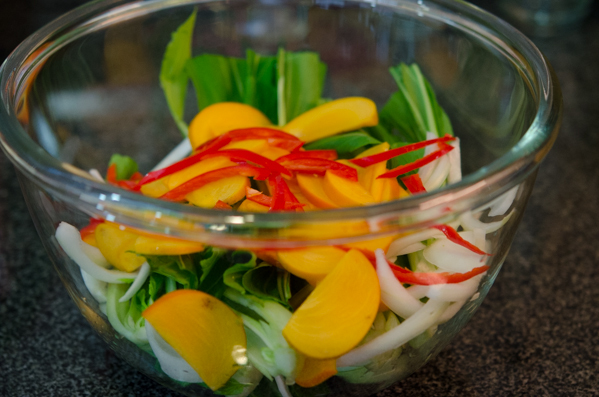 In a bowl combine the Bok choy, onion, persimmon, and red chili, if using. Drizzle the dressing over and toss well with your hand. Be very gentle when you toss them. How could you forget this for 2 years?! It looks wonderful! Really nice -- thanks. Wow, that looks beautiful! Can't believe you neglected to post it for 2 years :) I just bought some persimmons from the Korean market (love that fruit!). My mouth is watering, just imagining the flavor and the texture...with a steaming bowl of rice. You are amazing! Just made this tonight, it was great! Wonderful, Sandra! Glad to hear that you liked it. Thanks! Great! Thanks for trying out my recipe and posting it on your blog! It looks great! I love the addition of walnuts in the salad! Ha ha ha! I love your "fireball" song. I remember how spicy this salad was but I also enjoyed the flavors as well. Glad that you liked it. 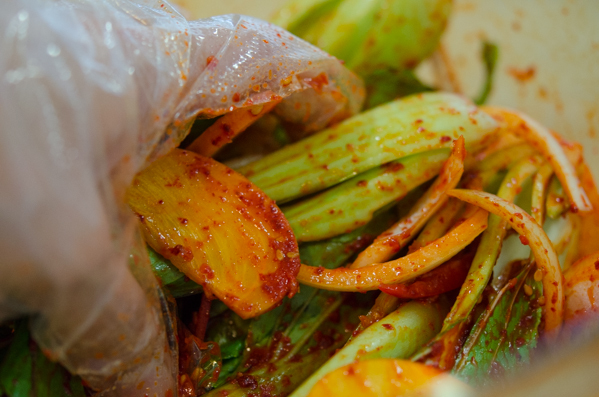 Hi Caroline Unfortunately, this kind of kimchi salad needs to be eaten soon after it is made. If you let it sit for a few days, the moisture will be extracted from both bokchoy and the persimmon, and loose its crispness. 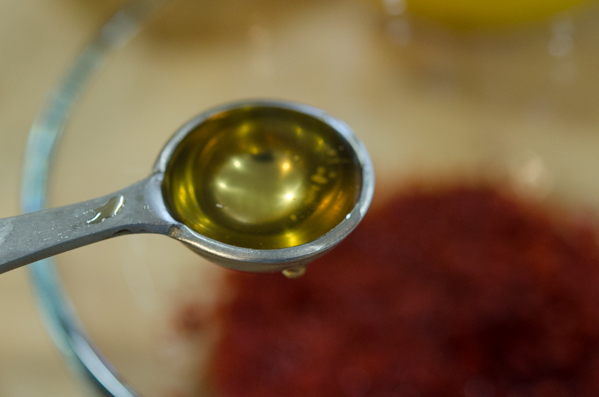 You can prep all the ingredients separately and store in the fridge before you combine with the sauce. That could be an option.